A top American bishop said Tuesday the Roman Catholic church will not comply with the Obama administration requirement that most employers provide health insurance covering birth control. 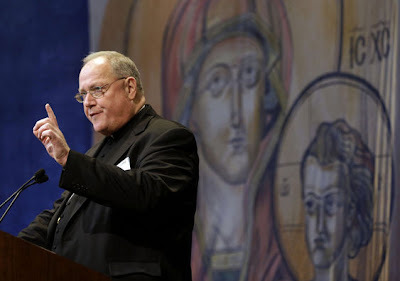 New York Cardinal Timothy Dolan, president of the U.S. Conference of Catholic Bishops, said church leaders are open to working toward a resolution with federal officials, but will meanwhile press ahead with challenges to the mandate in legislatures and in court. "The only thing we're certainly not prepared to do is give in. We're not violating our consciences," Dolan told reporters at a national bishops' meeting. "I would say no door is closed except for the door to capitulation."